Zoomer’s Mike Crisolago sits down with Donald Sutherland to talk about hitting the open road with co-star Helen Mirren for their new film, The Leisure Seeker. Think of The Leisure Seeker as a road trip movie for the life well-travelled set, less Thelma & Louise and more “Donnie and the Dame.” That’s Canuck acting legend Donald Sutherland, 82, and Dame Helen Mirren, 72, who play a married couple battling Alzheimer’s and cancer respectively and who break from the shackles of their daily routines to peel off in their camper van for one final adventure. MIKE CRISOLAGO: Why are hopeful films about aging important? DONALD SUTHERLAND: There is a hopefulness in being old, you know? I mean, if you get out there a little bit. If you stick yourself in a corner and don’t move, you stay in a chair, it just gets worse and worse. I’m 83 years old and I work. And I work because it’s a passionate endeavour. And if older people do that kind of thing and do some level of passionate work… I don’t know what it’d be like to retire, but I guess just so long as you don’t give up. MC: Helen Mirren has noted how much she enjoyed spending hours in the camper van with you shooting this film. What it was like, from your perspective, working with Helen out on the open road? DS: All I can tell you is that one day, we were driving along the road, and they were filming behind us. And I turned to her and said, “What if we just go?” And she said, “Could we?” And I said, “Should we?” And she said, “Probably not.” And then we accelerated, and suddenly, the [production] radio’s going, “Slow down! Slow down! Donald, you have to stop!” So the temptation was there, always. And she likes the idea – Helen – of getting a camper and going. The problem is with campsites – you want to go somewhere where you’re alone. And normally, you’re not. It’s hard. MC: It’s tempting, that idea of escaping. DS: I think it’s less escaping and more pursuing [in the film]. I think they’re looking for something. [They] look and look for an element of themselves, and they find it. MC: If you could jump in a camper van and take off, where would you travel to? MC: Is there a connection to Tuscany that you have? DS: No, just the love of it, you know? I love Provence and I love Tuscany. MC: What sort of research did you do for this role? DS: My mother had dementia … but probably the most influential aspect of my preparation was an organisation called Pines of Sarasota. They train caregivers for Alzheimer’s and dementia patients. They have courses, video demonstrations of how you approach someone. And by studying that, I got the reverse. MC: Does playing a character like this make you consider your own future pursuits? DS: You’d hope that I would learn something from something but I never do. I just keep going as if nothing’s going to change, and then a foot falls off. MC: You received an honourary Oscar at the Governors Awards in November. What does that mean to you? DS: It has been the most encouraging, wonderful [experience]. Francine, my wife, and I were in Rome. We’re sitting on the balcony and we have a bottle of water and two plates of spaghetti marinara. And the phone rings. I answered it, and a voice says, “Donald, it’s John Bailey.” He said, “I have been made president of the Academy of Motion Picture Arts and Sciences.” And I said, “Congratulations.” He said, “No, no, no. I’m phoning to congratulate you.” It was thrilling. And I said, “Speak to Francine.” He spoke to Francine. And then we hung up and ate spaghetti marinara. 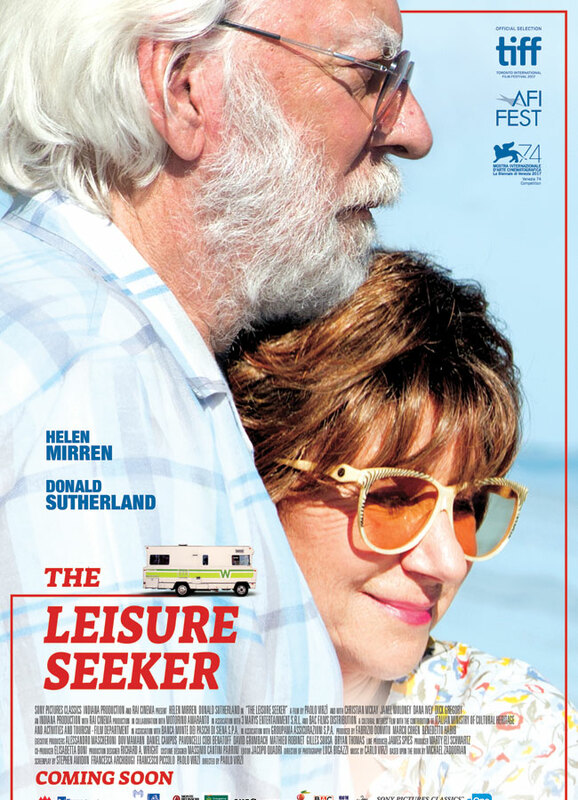 The Leisure Seeker opens in Toronto and Vancouver on March 16, with more Canadian openings to follow in the coming weeks. Check local film listings for times and locations. A version of this article appeared in the March 2018 issue with the headline, “Road Tripping,” p. 15.